Obviously, I have a thing for new outer wear when going on vacation. 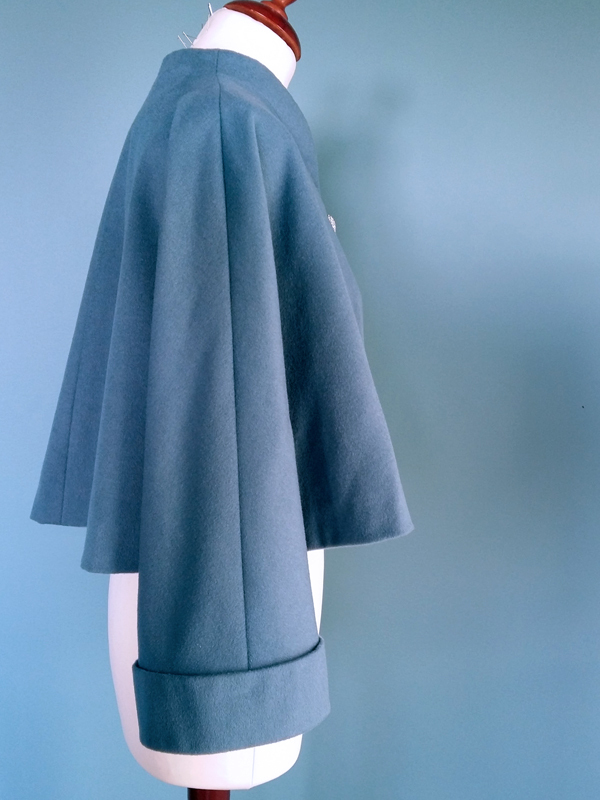 The Dior-suit for Paris, the ruby red coat for London - and now a blue-grey cape-jacket. It wasn't planned at all; it wasn't even on my short list. I bought the pattern - Vogue Vintage Model V2934, an original design from 1950 - years ago at some sale, and then my sister bought some lovely wool in China, with the pattern in mind. And then I had it in my stash, and actually thought the wool would become a dress instead. Sometime. On the Friday, I heard myself saying, "nah, I won't start another sewing project before Lisbon. The lace skirt is just finished, and there is so much going on at work." On the Sunday, I found myself making a toile, steaming the wool and adjusting the pattern. Ten days later it was done, something of a personal record for me. 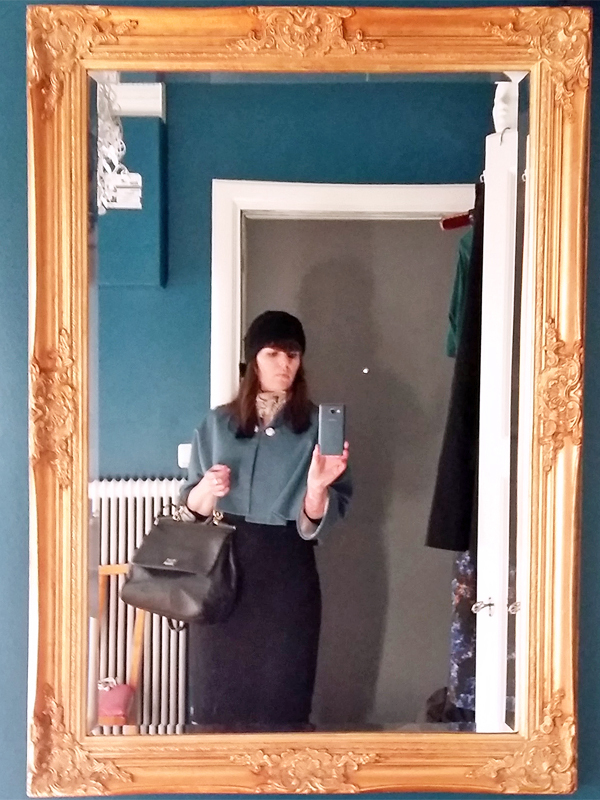 I wore it to work to see if I liked it enough to take to Lisbon - I did! - and so it went with me there. A bit too warm for some days, but I felt so chic and ladylike that I wore it anyway. The wool is rather heavy, with a lovely sheen and nap, very much like the wool for my coat. Perhaps it's a seal skin as well? The lining is a slippery, ivory silk, that my sister also bought for me in China. So let's take a closer look at the jacket or cape or cape-jacket. It's a really simple design - two front pieces and two back pieces. Centre back is not on the grain, which gives the lovely drape (and eats fabric). 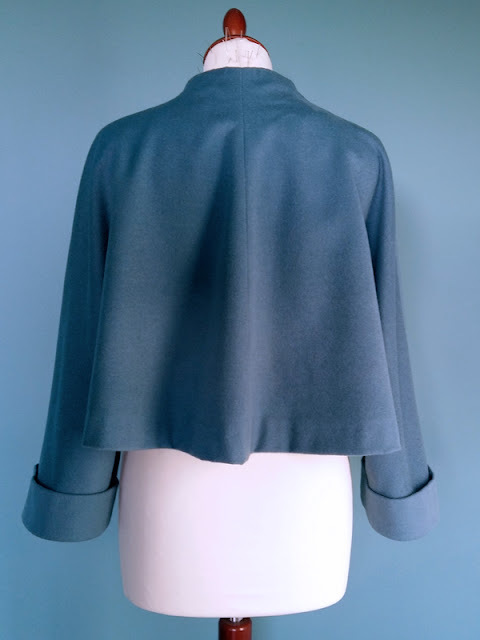 Darts very cleverly shapes the collar, and then cuffs to finish the shorter sleeves. Knowing that the amount of ease in contemporary patterns is a bit ridiculous, I cut a size small (even though they think that my waist measurement should be 10 centimetres less than I have) and the fit was perfect. 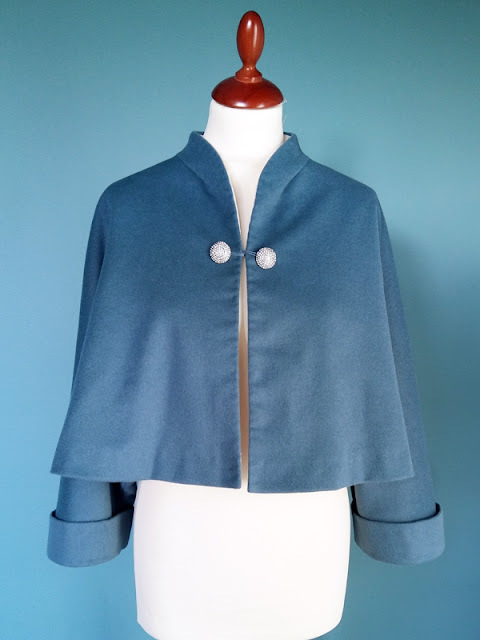 I shortened both the sleeves and the cuffs 2 centimetres, and did the cuffs on the fold instead of with a facing - too much bulk. I used horsehair canvas - as said in the instructions - as interfacing for the centre front and collar. I followed the instructions and cut the facing in wool, sewed it on, cursed it for quite some time and then removed it again. Reason one was the itchy wool next to my neck. Reason two was that the width of the facing and interfacing made the front part too stiff, and all the lovely intended drape over the bust area was lost - it just stood right out. I cut down the facings in the front, making them less wide. 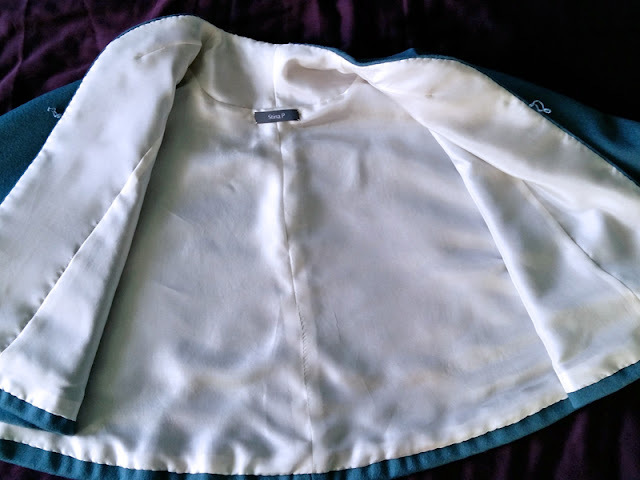 Since I've already cut the lining, I cut the facings in the same silk, doubled it with silk organza, sewed it by machine to the lining and then fell stitched the whole piece to the wool (after prick stitching the edges). 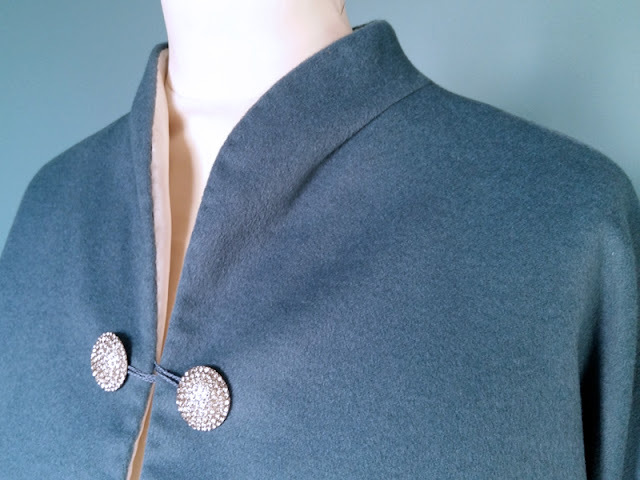 I also did my very own version for closing - two loops and two rhinestone vintage buttons. A bit of a mess to close, but very beautiful. Thanks! I can really recommend it.